Zaha Hadid’s Wangjing SOHO design (left). Chongqing Meiquan 22nd Century design (right). Image from AFP. Earlier this year, the architecture world was in shock after a story made the rounds that a Zaha Hadid designed project in Beijing is being pirated by a developer in Chongqing. 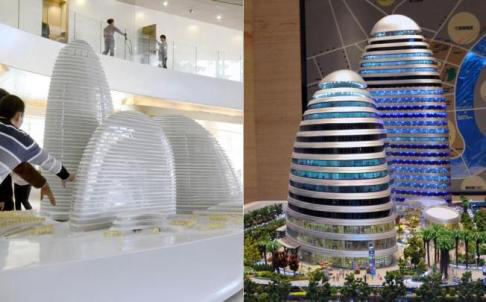 What’s surprising about this story is not the actual copying of Hadid’s design but the reaction from the design media, as if this is the first incidence of architectural piracy in China. Of course this is not the case as building designs are routinely copied in China. However, what makes this instance unique is that while Hadid’s design (Wangjing SOHO) is still under construction, the copied version (Chongqing Meiquan 22nd Century) is set to complete first. Pan Shiyi, Board Chairman of SOHO China, Hadid’s client, has not kept quiet about his disapproval, and is now taking legal action against the developers in Chongqing. This situation brings up the reoccurring discussion about authenticity (or lack thereof) in China. It is no secret that China ‘learns by imitation’ in everything from product design to software development. In the realm of architecture, it is not uncommon to come across functioning replicas of famous buildings from history (like the Chrysler Building, Sydney Opera House, or the entire Austrian Village of Hallstatt) in China’s cities. Hadid’s office speculates that perhaps someone got hold of their plans for Wangjing SOHO to produce the copy. Yet having seen Chinese architects in action, it would not be far-fetched to speculate that the designers of Chongqing Meiquan 22nd Century saw nothing more than a computer rendering of Hadid’s project on the internet to generate something of similar likeness. Architects around the world learn from other architects. Websites like ArchDaily are a great resource for architects to promote their work and for other architects to get inspired. Like professional writers, there is an unspoken ethical code among architects about borrowing from other designers: re-using certain ideas or building elements is ok, even flattering at times, but outright plagiarism is never ok. This response is very telling of where the value of architectural design lies today in China. While it could be argued that China is still in its “learning phase” of development, it is starting to become clear that the country’s ambitions lie much further beyond not only being the ‘biggest’ but the ‘best’ – even if that means using dishonorable means to get there. Michael Grau - A word on the chinese habit of copying originals. Chinese Copies don’t worry me. I happen to be one of the people who built Soho Galaxy and Wangjing Soho. For both projects I developed software that allowed us to deal with the complex geometrical challenges involved in such projects. I witnessed how much sweat and hard work went into the designs, some of the sweat was my own. I enjoy the process of coming up with unique solutions, it’s my life. My wife is an architect too, she is mainland chinese, working a lot in Beijing and China. She refuses to copy german villages. Our daughter knows both worlds and I wonder what she learns in school. Here I can only speak for myself. Personally I am not worried about our buildings being so obviously copied. It’s not how I grew up but after having spent some time here I do understand. This is China, this is just how it works. People learn by imitation, people imitate what they like. Here copying is a doctrine, its even the law: to do business in china one has to collaborate with a local partner. And how many companies got burned when they found that their local partner copied the new factory with all the processes inside to build a very similar product to only his own benefit? Plus endless evergreen jokes about things feeling familiar, just minus the functionality. Now this is really old news and something we meanwhile should have gotten used to. Part of the process. What I do very much worry about is something slightly different, a related question. As I said the copying is a protected, man made doctrine in a centrally governed country that was a totalitarian country just a short time ago. Therefore it’s ubiquitous. Furthermore the copying has it’s roots in the culture, there will not be anything wrong with it. You copy, you learn. After a lot of learning comes mastership and with it originality. Original work set’s you apart from others, it is by defiinition outstanding and special. What sort of doctrine is in place for the arising outstanding original people who went through all the learning? I do understand that the world will be a good place when original thinking, therefore the individuum, maybe my daughter, finds a home in China too. What worries me is the thought that this transformation might not happen soon and that historic, cultural and other pressures don’t allow that great country to be as original as it needs to be to be truly impressive. Thanks for your comment. I agree with most of what you said, especially pertaining to copying as doctrine in China. Although to be honest I am still not sure how much of it has to do with the country’s recent history of totalitarianism vs long-held Chinese cultural characteristics. Perhaps it is a bit of both. One thing is for sure though: foreign companies make a “Faustian Bargain” when they chose to do business in China, trading intellectual property for cheap labor and/or access to the huge consumer market. Intellectual property transfer is the whole point behind joint-ventures. In the case of architecture, IP is even more easily transferred, as all it takes is one look at a rendering for a newly proposed building to make a copy.